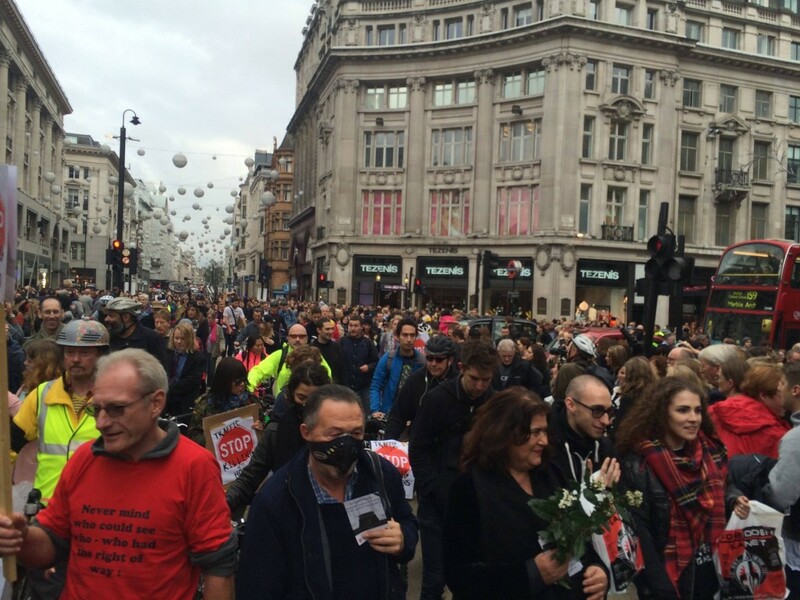 Cycling and pedestrian safety protesters staged a symbolic funeral protest down Oxford Street to Marble Arch yesterday, Saturday 15th November. 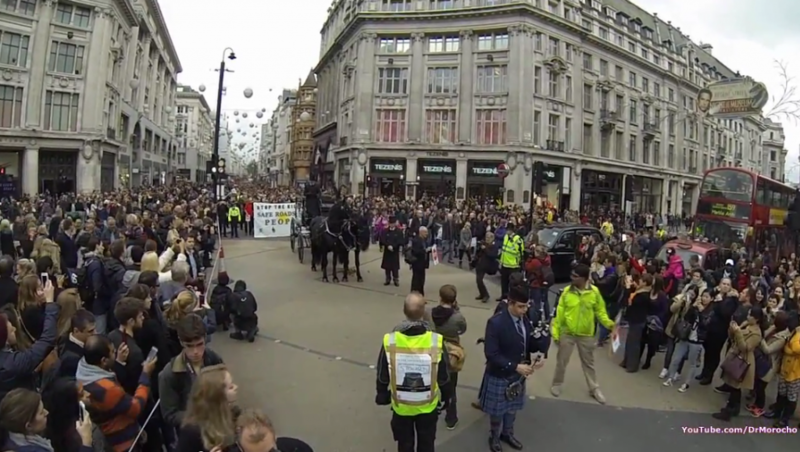 The horse-drawn hearse paused at Oxford Circus for 2 minutes silence, to allow the crowds to mark the terrible toll of death, injuries and poisonings caused by motorised transport. It then proceeded to Marble Arch, led by a lone bagpiper, where the protesters placed the symbolic coffin on a catafalque and staged a Dutch style die-in around it, in a ten minute meditation to mark the memory of the dead. The reform of national, regional and local Transport Departments into Walking, Cycling and Transport Departments. Speakers included Professor Brendan Delaney, Kings College; Tom Kearney, Safer Oxford Street; and Caroline Russell, Green Party Transport Spokesperson. *Stop the Killing Coalition includes: Westminster Living Streets, Campaign Against Climate Change, Stop Killing Cyclists, London Green Party, Safer Oxford Street Campaign, The Ecologist Magazine, Permaculture Magazine. 1. Stop Killing Cyclists is the direct action protest group set up after last November’s terrible spate of cyclist killings in London. 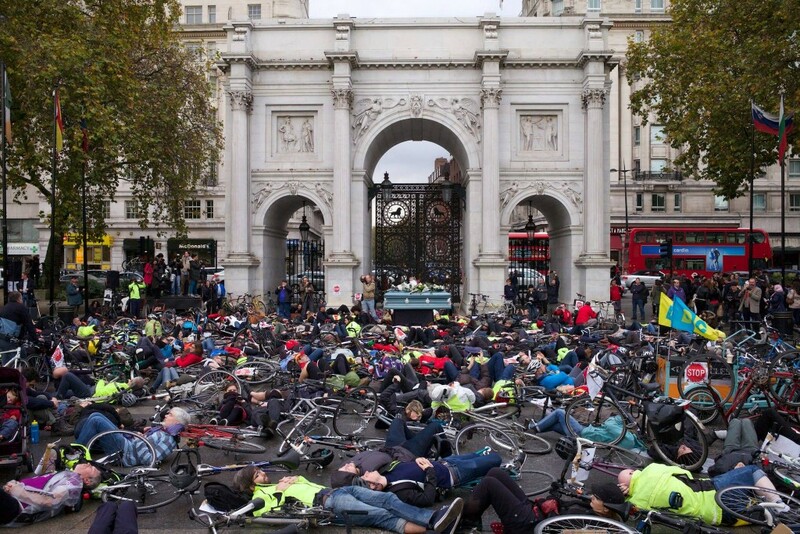 They arranged the mass Die-In at TfL HQ where 1,500 cyclists laid down in the road in protest at lack of safety investment in London. 2. 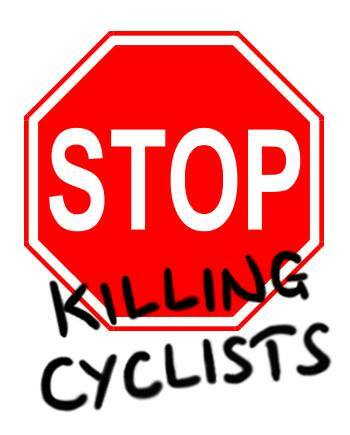 Stop The Killing is the associated group of pedestrian, cycling and environmental grass-root activists who want to eliminate Traffic Violence which includes Westminster Living Streets, Stop Killing Cyclists and the Campaign Against Climate Change. Thus the number of people whose deaths can be attributed to traffic violence over the last decade is the equivalent of the population of Manchester! This is the equivalent of the entire populations being injured or killed of Birmingham (1.1 million), Glasgow (0.6), Cardiff (0.3) and Manchester (0.5) combined! 4. 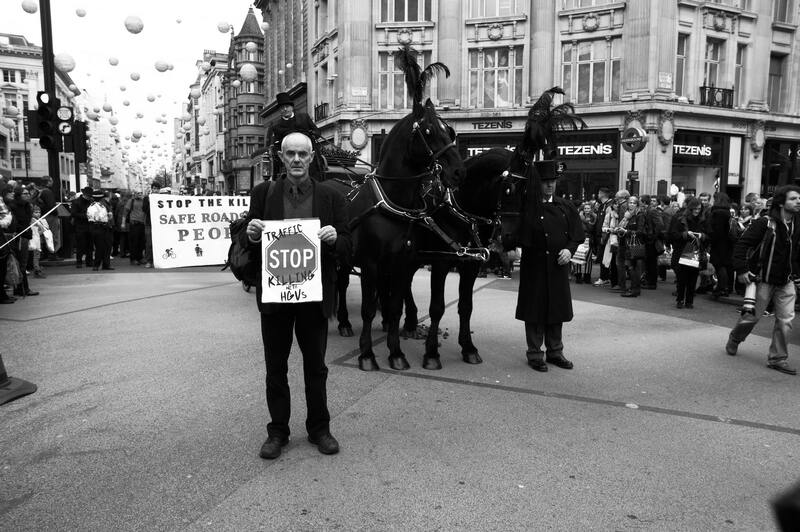 The rally after the Mega Die-In under Marble Arch included Medical Professor Brendan Delaney, Oxford Street Bus Victim Tom Kearney, HGV cyclist victim Bart Chan, Poet Helen Moore, Opera Singer Louisa Beard and Stop Killing Cyclists Co-founder Donnachadh McCarthy. Stop the Killing of Children – set up national multi-billion pound programme to convert residential communities across Britain into living-street Home Zones to abolish dangerous rat-runs. Stop the Killing of Pedestrians – establish a national programme to fund pedestrianisation of our city and town centres, including the nation’s high-street – Oxford Street. Stop the Killing of Pensioners from excessive speed. Introduce and enforce speed limit of 20 mph on all urban roads, 40 mph on rural roads/lanes and 60 mph on all other trunk roads. Stop the Killing of Cyclists. Invest £15 billion in a National Segregated Cycle Network over the next 5 years. Stop the Killing by HGVs. Ban trucks with blind spots by making safety equipment mandatory and strictly enforce current truck-safety regulations, to reduce levels of illegally dangerous trucks down from estimated 30% to less than 1%. Stop the Killing without liability – introduce a presumed civil liability law on behalf of vehicular traffic when they kill or seriously injure vulnerable road-users, where there is no evidence blaming the victim. Stop the Killing from Lung, Heart and other Diseases caused by vehicular pollutants. Make it mandatory for particulate filters that meet latest EU emission standards to be fitted to all existing buses, lorries and taxis. Stop the Killing at Junctions. Introduce pedestrian crossing times long enough for elderly disabled to cross. Legalise filtered junction crossings by cyclists with strict legal priority for pedestrians and carry out urgent programme of physically protected left-hand turns for cyclists. Stop the Killing from CO2 emissions from impacts of the climate crisis. All transport fuels to be from environmentally-sustainable renewable sources within 10 years. Focus on Life! Transport governance must make safety and quality of life the top priority. Reform all council transport departments, the Department of Transport and Transport for London into Cycling, Walking and Transport Departments with formal pedestrian and cyclist representation.